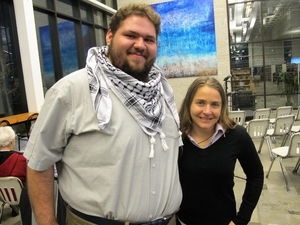 Tarek Al-Zoughbi (left), of Wi’am: the Palestinian Conflict Resolution Center, and Sahar Vardi (right) with American Friends Service Committee spoke at Speaking Our Peace at Canadian Mennonite University on October 27. Tarek and Sahar shared their own personal experiences as a Palestinian and as an Israeli working towards just peace in the current challenging context of Israel and Palestine. Sahar Vardi and Tarek Al-Zoughbi live less than 20 kilometers away from each other—Sahar in Jerusalem, and Tarek in the West Bank city of Bethlehem to the south. A literal wall, checkpoints and cultures of mutual hatred separate the regions each call home. The two activists, who met only weeks ago, are pushing toward new paths of peace. Sahar, a 28-year-old Jewish Israeli, did prison time for refusing military duty in protest of her country's 51-year-old occupation of the Palestinian territories. She now works as a peace advocate with the American Friends Service Committee (AFSC). Tarek, a 24-year-old Christian Palestinian, works with Wi'am: The Palestinian Conflict Transformation Center, training youth and young adults in peace and reconciliation. On the evening of October 27 the two spoke to a packed audience in Canadian Mennonite University's Marpeck Commons. The event was one stop on a four-province tour sponsored by Mennonite Central Committee, partners of AFSC and Wi'am. As part of MCC's Cry for Home campaign, the tour encourages Canadians to advocate for a just peace in Palestine and Israel. MCC has worked in Palestine and Israel since 1949. Tarek and Sahar's congenial sharing of the stage during their presentation and in the question period afterwards was itself a picture friendship and reconciliation. Tarek opened their presentation by describing the conditions his community experiences under military occupation: the encroachment of Jewish-Israeli settlements surrounding Bethlehem (which are illegal under international law), the lack of freedom of movement, the hampered economy, and the widely varying living conditions for Palestinians living in Israel and in the Palestinian territories of the West Bank, Gaza, and East Jerusalem. The occupation has deeply affected psyche of his people, he said. "With the loss of control, we have not been able to practice our culture in a regular way, which has led to an identity crisis—where Palestinians have also become foreign to each other." Palestinian Christians experience further isolation as they see the settlements around them being supported by fellow Christians in the west. Sahar spoke of growing up surrounded by soldiers and weapons, her schooling saturated with military imagery. While Palestinians fear Israeli guns, she said, "the way we Israelis are raised to think is that they give us security." This trust in arms is reinforced each spring in three back-to-back commemorations—Passover, Holocaust Remembrance Day and Independence Day. "You take facts and you decide what the narrative is to be built around them," Sahar said. But Israel's peace treaties with Israel's one-time enemies and neighbours, Egypt and Jordan, show that the narrative of hostility need not be permanent—and yet the narrative of military might persists. Sahar drew attention to the fact that Israel's military, by far the most powerful in the region, is exporting its technology and hardware—tested in its wars and its recent bombing missions in Gaza. Its customers include both western governments like Canada, and oppressive regimes like the Philippines. "Our economy is based on oppression of other people," she said—and not just Palestinians. "We need to think about what security is. There are more sustainable ways that build community rather than destroying it." Tarek added, "The best way is to find a win-win way forward. Continuing the status quo makes the situation more bleak." Grass roots activism for peace in their regions has declined over the last two decades, giving way to a sense of resignation and futility. Gone are the days in the 1990s when young Sahar and her parents would cross the line to work with their Palestinian neighbours to protest the occupation. Tarek and Sahar believe that the key to change in their land today is international pressure. They challenged their audience to get involved in advocacy for justice and reconciliation—both in their own contexts and in Palestine and Israel. Sahar told how Canadians are complicit in injustice when their government supports Israeli militarism—for example, in the use of Israeli military trainers for "security" strategies. They can lobby their representatives to stop supporting Israeli militarism in this way. When it comes to solutions to Palestine and Israel, each agreed that ending the occupation is only a first step. Beyond that, principles and attitudes should be the focus, not just what is "realistic"—whether one-state, or two state (or "no state," Sahar quipped). Whatever its form, a just peace in Palestine and Israel for Tarek include four requirements: equal and protected rights for all; some form of citizenship for all; recognition of the history of all, especially the marginalized; and equal access of each side to each other's land and cultures. A question from the floor about how to respond to anti-semitism was especially poignant, since the mass shooting of worshipping Jews in Pittsburgh had just taken place that morning. We must look hard at the reality of racism wherever we are and act against it, said Sahar, who identified herself as a privileged "white Israeli." The audience was thus left with the ball in their court. "Don't shy away from difficult conversations," Tarek advised. "Move into action, learn about how you are complicit, and talk about how you can be part of a move to justice." Story by Byron Rempel-Burkholder, a Winnipeg editor and writer.